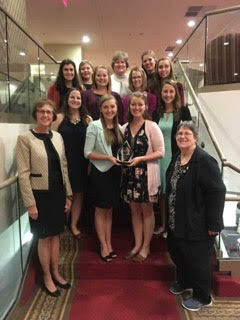 The University of Indianapolis Sigma Omicron chapter of Kappa Delta Pi earned several notable honors at the organizations 51st biennial convocation in Pittsburgh, Penn. in October. The UIndy chapter was awarded its seventh ACE (Achieving Chapter Excellence) Biennium award as one of the top 22 out of 626 chapters worldwide. President Emily Taylor and Historian Lyndsy Eslinger accepted the award for the chapter. Several members of the UIndy chapter attended the event. 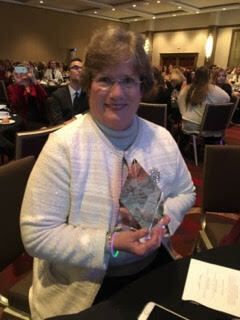 Eslinger said it was an extremely meaningful culmination of teamwork to win the award. “To be grouped with the most elite chapters worldwide truly speaks to the amazing professional development, community service and teacher preparation programming the University of Indianapolis and the Sigma Omicron Chapter of Kappa Delta Pi offers. 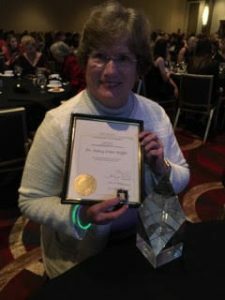 As shown by receiving this award, the University of Indianaapolis’ Kappa Delta Pi chapter is just another part of UIndy that creates an inspiring experience for students!” Eslinger said. Nancy Steffel, professor of teacher education, was recognized with the Lucinda Rose Award as the Outstanding Counselor of KDP for this biennium and then inducted into the Eleanor Roosevelt Society for her contributions to the honorary and education as counselor of UIndys Sigma Omicron Chapter for 20 years.